Thames Wharf North rooms are a perfect option for students who prefer to have their own space. The rooms are furnished, including en-suite showers, desk, chair and wardrobes with ample storage. 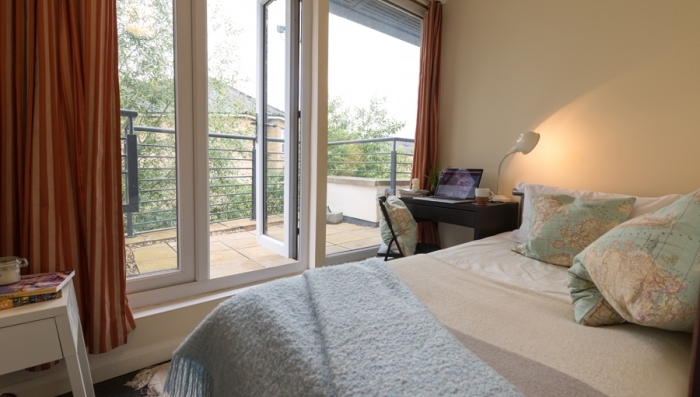 The rooms have access to a communal balcony with stunning views of the canal below. All rooms have access to a communal kitchen. Large kitchens are available on each floor with shared fridge and freezers. Students will have individual food storage cup-boards. All kitchens are furnished including: oven, microwaves, kettles, toasters and cutlery and cooking utensils.Students will need to bring their own towels. Thames Wharf North is based in Central Oxford, within walking distance to Oxford Business College, retail shops, restaurants, museums, bars as well as many of Oxfords best known attractions. If you have booked a taxi transfer, your driver will be waiting for you at Arrivals holding a sign with your name on it. Residence co-ordinator will be there to greet you. Please call the residence coordinator +447493045498 at least 30 minutes before your arrival. If you arrive before check-in there is a pack packers hostel where you can leave your luggage for a small fee (under £5). It is an 8 minute walk away from the residence and in the city center so three are plenty of shops and cafes around to explore whilst you wait. No deposit will be collected on arrival, but students will be asked to sign a disclaimer and credit card details will be taken in case of any damages.